Automatically send your voice message broadcasting it to prospects and customer. I had searched through dozens of web sites looking for a simple, easy to use and affordable auto-dialer software. I downloaded several test versions of from other vendors, and couldn't get any of them running. Then I found the Acarda Messenger, it was easy to understand and use and worked immediately with my dialogic card, and they were half the cost of the other products. Jim H., Eden Prairie, MN, USA. After spending several days, YES DAYS! testing other voice casting software I was truly in despair. Other products were either to complicated to implement (too many steps) to launch a campaign or simply were "bug ridden". I needed a system that could be deployed quickly and reliably. I quickly found the product to be both intuitive and reliable, I was implementing my voice marketing campaign within a half hour of software installation. A month later, I was so delighted, I just upgraded to the 8 line version! Philip F., Minneapolis, MN, USA. Buying our fouth Acarda Messenger system! I just wanted to drop you a quick note to tell you how happy we are with Acarda's Autodialer System. It is proving to be a very usefull tool in both sales calls and confirming as well as soliciting attendance to our seminars. I highly reccomend it. That might not come as a surprize as I will be buying our fouth system later this week. Bruce M., Glastonbury, CT., USA. I operate a small mortgage company near Washington DC. I aim to keep my overhead as low as possible and have used Acarda Messenger over the last 5 years to find new clients. It works. It has really given my company an edge over our competitors. Good leads are very expensive. My leads are virtually free. Buy this product! Troy H, Woodbridge, VA, USA. Acarda Messenger Auto Dialer automatically phones a list of people and plays them a pre-recorded message about your product, service or event. Acarda Messenger Auto Dialer software is licensed by the number of telephone lines you want to run it on at one time. 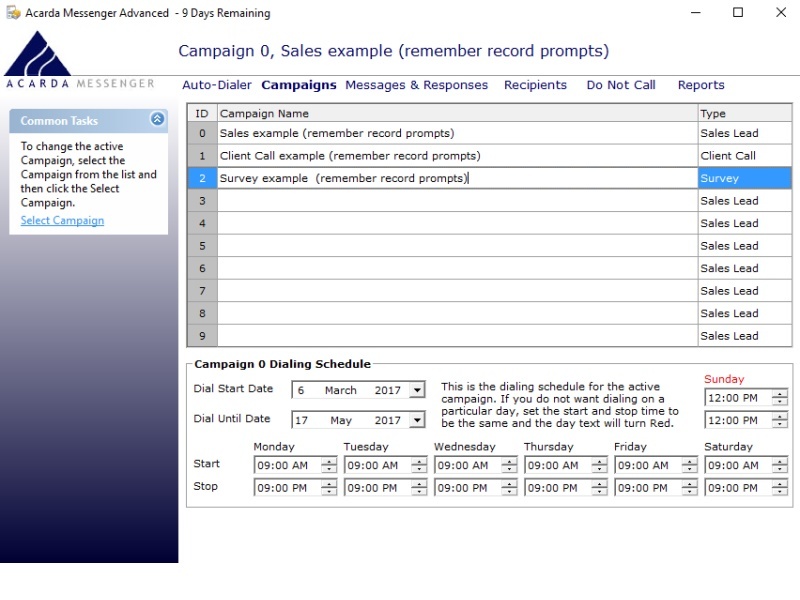 There are two editions; the Standard Edition includes only a Sales call flow template while the Advanced Edition includes call flow templates for Sales, Client Call, and Survey. The following pricing is for either a 6-Month Rental license or a one-time outright purchase of the license. These include up to thirty minutes Acarda Messenger Configuration & Training service to help you get up and running. Please note the license is for the autodialer software but you need also to have the appropriate hardware to run the software on – refer to note below on hardware requirement. What hardware is required for an auto dialer? Our Autodialer, Acarda Messenger, is installed on to your own computer and run in-premise rather than being cloud-based. This means you have full control over it and the calling lists you import into the dialer remain on your system. Acarda Messenger autodialer works with Dialogic Cards such as the D/4PCIU, D/4PCI, Dialog/4 , D/41D, D/21D and other compatible cards. You could start by searching on eBay.com. Look for something like “Dialogic Card D/4PCIU”. There are variations as to the model number that might be listed e.g. D/4PCIU, D/4PCIUF, D4PCIUFW. Be careful that you buy the type of card that can fit in a slot in your computer motherboard, usually the older, less expensive, universal PCI or the newer PCI Express slot. You can also purchase a range of secondhand Dialogic Cards from Ace Systems. You may need assistance from your IT/computer support people to put it together. If you buy a Dialogic Card make sure you ask for the Dialogic Drivers that are needed for it. How many calls can an autodialer make? 1. 60 minutes * 60 seconds in a minute: 3600 seconds in one hour. 2. 3600 seconds divided by 36 seconds per call = 100 calls per hour. 3. In a ten hour day you’d call 10*100 = 1000 telephone numbers. So if you had four lines you’d make approximately 4000 calls in a day. In practice you will probably find auto dialers make less calls than this. Some people work on a rule of thumb of 1 call per minute per line e.g. 60 calls per hour per line. How do autodialers work out if they reach a real person or voice mail? Autodialers such as our Acarda Messenger Auto Dialer work out how long the greeting is when the call is answered and based on that they decide if it is voice mail or a live person. Typically when a live person answers a call it will be a short greeting say less than 3 seconds in length whereas when a voice mail system answers a call the greeting is longer. Think of the times you have personally called someone and started talking thinking it was a real person but then found it was voice mail! Sometimes it is difficult to distinguish between voice mail and a live person and the auto dialer won’t get it right all the time. There are usually a few settings you can fine tune to make answer machine detection more reliable. Can an auto dialer be used for debt collection or appointment reminders? The Advanced Edition of Acarda Messenger has a Client Call template for calling clients. This voice broadcasting call flow can speak dates, times and money amounts so it is perfect for reminding people of upcoming appointments or an overdue debt. You can also just play a message to tell them about a special event. Can an auto dialer be used for telephone surveys? The Advanced Edition of Acarda Messenger has a Survey template for telephone surveys and polls. With this call flow the auto dialer automatically phones a list of people and asks them a set of questions that they can respond to using their telephone keypad. Use it to carry out market research, telephone polls, test new ideas and to gather opinions.